Description	 MS in Latin on vellum, Amiens (or Beauvais), France, 1300-1325, 2 ff., 29x20 cm, 2 columns, (20x14 cm), 21 lines in a formal Gothic book script of highest grade, square notation on a 4-line red staff with C clef, a 1-line decorated initial in blue, pink and orange with white highlighting, 14 2-line decorated initials in gold, blue and pink, some with single bar borders, with ivy leaf motif sprays, in pink, orange, blue and gold with white highlighting, 1 initial in the shape of a fish, illuminated with colours. Context	 This MS had 309 ff. when sold by Sotheby's in 1926. It was broken up by Otto F. Ege. Other leaves from same MS: 2 ff. 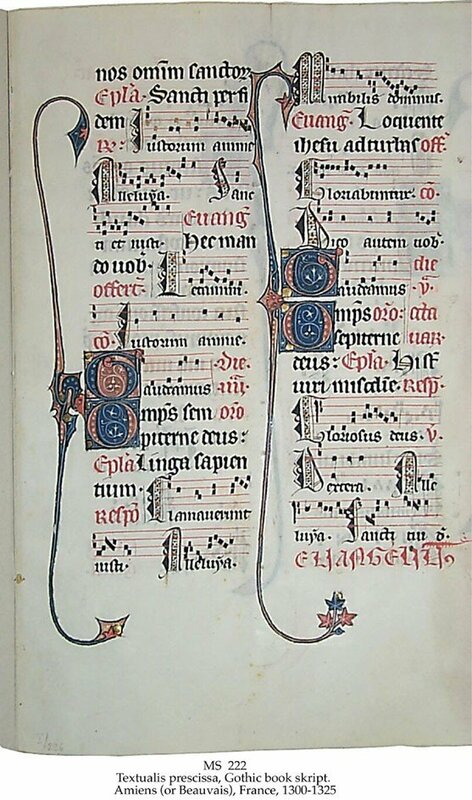 : Rochester, Eastmann School of Music, Sibley Music Library; 1 f.: Buffalo and Erie County Public Library, Otto Ege, Cleveland, Ohio: 50 Original Leaves from Medieval Manuscripts ca. 1950, no. 33 (Christie's 26.6.1997:16), leaf 15; 2 ff. : Boston, Public Library, MS 110 + 1538; 1 f.: Chicago, University Club; 1 f.: Virginia, Hollins College Library, no 11; 1 f.: Pennsylvania, Pitcairn Collection, Glecairn Museum; 1 f.: New York, Pierpont Morgan Library, MS M1021; 1 f.: Boston, Endowment for Biblical Research, MS Leaf 86; 1 f.: Sotheby's 25.11.1985:61; 1 f.: Maggs Bull. 11(1982):43; 2 ff. : Ferrini Cat. 1(1987):48-49; 1 f.: Duschnes Cat. 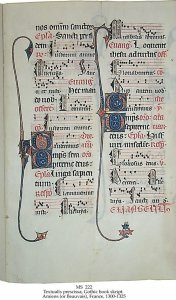 54:25; 1 f.: London, Christopher de Hamel Collection, MS 135; 1 f.: Harvard, Houghton Library pf. MS.Typ.405. Provenance	 Leaf 1: 1. Robert de Hangest, canon of Beauvais; 2. Beauvais Cathedral; 3. Henri Auguste Brölemann, Lyon (until 1854); 4. Arthur Brölemann, Lyon; 5. Etienne Mallet, Lyon (until 1926); 6. Sotheby's 4.5.1926:161; 7. Permain (from 1926); 8. Otto F. Ege, Cleveland, Ohio, 50 Leaves from Medieval MSS 1944/1945:10; 9. Ellin Mitchell, New York; 10. Bruce Ferrini, Akron, Ohio, March 1989; Leaf 2: 1 - 8 : As above; 9. Bernard Rosenthal Collection, I/226, San Francisco; 10. Bernard Quaritch Ltd., Cat. 1147(1991):60. Commentary	 High quality illumination by a group of artists who worked in Amiens and produced the luxurious Psalter and Hours of Yolande de Soissons, now New York, Pierpont Morgan Library, MS 729. In the highest grade of Gothic book script (Latin: Littera minuscula gothica textualis prescissa formata), the feet of the minims are sharply cut off horizontally.